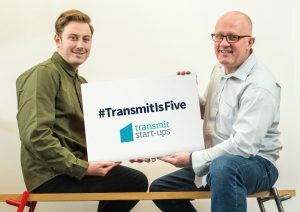 Team NEN member, Transmit Start-Ups, a start-up established to help other entrepreneurs fulfill their ambitions, has pledged to back 5,000 businesses with finance by April 2020. Transmit Start-Ups has set itself a challenge to reach the ambitious milestone as part of its fifth anniversary celebrations. The company was set up in 2013 by entrepreneurs Damian Baetens, Richard Myers and Ian Straker who shared an ambition to help others just starting out. By delivering the Government-backed Start Up Loans programme they offer entrepreneurs an alternative to a traditional bank loan, with high-impact mentoring to maximise the results of finance provided. Transmit has already backed 3,611 businesses across the UK with £35million and has become the biggest lender of its kind in the North East and Scotland. It now aims to become the number one Start Ups Loans provider across the whole of the UK, both in terms of volume and customer feedback. Richard Myers, Commercial Director at Transmit, said: “It’s five years since we launched Transmit Start-Ups with an unapologetic ambition to shake up the UK’s business support landscape. As entrepreneurs ourselves, we wanted to do things differently – to provide the level and style of service entrepreneurs need and deserve. The Transmit team has now grown to a team of 27, with offices in Gateshead and Glasgow. Demand has also led to the launch of the Transmit Group of companies, providing financial support and business advice to power the long-term journey of entrepreneurs. Newcastle-based furniture and interiors studio, Psalt Design was one of Transmit’s first ever loan recipients and has gone from strength to strength since its initial cash injection to launch its first product, a hand-blown glass fish bowl. Founder Richard Bell said: “The business support we received was great and played a large part in our initial growth. The loan gave us the platform to begin to sell our first product and it is amazing to see how the company has grown since. Just over a year ago Larah Bross secured finance from Transmit Start-Ups to set up Bross Bagels and already business is booming. With two shops in Leith and Portobello, the launch last month of an ice cream bagel with Ben & Jerry and a new doorstep delivery around the UK, Larah is preparing to make her next move with new shops and possibly franchising. The Montreal-born entrepreneur is now planning to share her start-up experience to help inspire other fledgling Scottish businesses, speaking at Transmit Start-Up’s fifth birthday celebrations. Larah said: “We are so excited about the future and we are planning our expansion with new shops in town, in Glasgow and maybe further afield by franchising. To mark Transmit Start-Ups’ first five years in business the company has released a report celebrating some of the businesses it has supported and its plans for the future.